Can never go down Can never go down the drain. Can never go down the drain. This may seem like a silly song, but if you’re a writer and know what fear is, you might want to sing along with the newly rediscovered Fred Rogers. 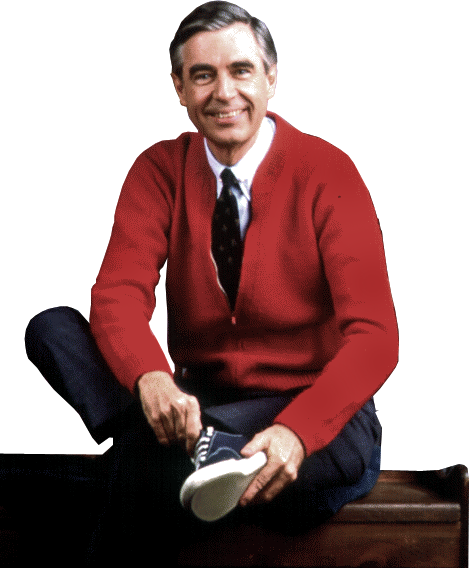 Considered a super hero in these dark times, albeit wearing a cardigan instead of a cape, people are flocking to see the hit documentary, “Won’t You Be My Neighbor” this summer featuring the unlikely superstar. Fred Rogers has been a hero of mine for a long time. When my kids were little and hit the hungry horrors right before supper, I’d turn on the television and let Fred and his neighbors calm them down. I loved the lessons he taught them about being empathetic, inclusive, kind, and how to embrace the ordinary joys in life. When I was finally able to admit to myself that I wanted to write, that it was too important for me to keep calling it a hobby, I was terrified. Once you declare to the world you are a writer, you are “out there,” meaning you have just invited a cargo ship packed with containers of pain into your life. Sure, there is also joy, but who needs help dealing with joy? No one would argue that rejection feels good. Writers have been known to publish, post, and cover their walls with rejections. Even the mighty Stephen King. Writers expect rejection and are usually surprised if it doesn’t come. But rejection isn’t the worse pain for many writers. It’s fear. And it comes in as many genres as there are writers. Yes, fear of rejection is a big one. But there are others. A huge fear is not writing “perfect.” (Author Brene Brown has written a library filled with books on how to deal with imperfection. The Gifts of Imperfection, Daring Greatly, and Braving the Wilderness, just to name a few. )Then there’s fear of humiliation. Fear of failure. Fear you won’t get an agent. Fear your agent won’t sell your book. Fear no one will blurb you. Fear no one will show up for your appearances. Fear no one will review your book. Fear that if they do, they’ll trash it. Fear you won’t sell enough books to earn out your advance. Fear your publisher will drop you. Fear your second book wont’ be as good as the first. Fear is flipping exhausting. It’s counterproductive, depleting, and often irrational. It can also be distracting, taking you away from the one thing you want to do, which is to write. It’s my biggest demon, much to the surprise of many who know me as the lawyer who can stand before a judge, advocating for a client passionately and articulately, seemingly fearless. Well, no one is immune from fear and I’m no longer afraid to admit it. I may be a tiger in a courtroom, but put a pen in my hand and I quiver. I’m dealing with it because the alternative would be not to write and that’s unthinkable to me. I’ve been wearing a bracelet that sometimes is mistaken for a medical alert tag for about ten years. You guessed it. 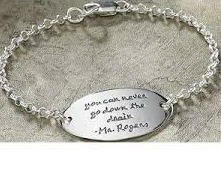 It says, “You can never go down the drain, Fred Rogers.” It reminds me that I’m bigger than my words, my publisher, my readers, and my critics. While they are all important to me as a writer, I can never go down the drain.